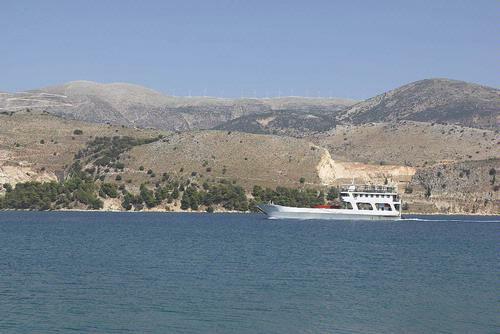 One of the car ferries that frequently makes the journey between Lixouri and Argostoli. This is the second largest town on the island and former capital. Like Agostoli, Lixouri was devastated by the 1953 earthquake and had to be rebuilt. As such, most of the architecture is modern. Lixouri is situated on the bay of Argostoli on the Palic Peninsular and can be reached by road or on the regular ferry from Argostoli which takes 25 minutes. Lixouri is an attractive town with wide streets and small squares. The town has the usual facilities of Banks, a Post Office, shops, restaurants and tavernas. The ancient city of Pali, now known as Duori is just north of modern Lixouri and is first mentioned in 1535 in a written protest to the Venetian senate. The Palic peninsular is is named after ancient Pali. The second oldest school in Greece, The Paliki Philharmonic school is situated in Lixouri. It was founded in 1836 and the school band often plays in the main square during the summer months. Sites to visit include the Philharmonic School, the Petritsios Library, the church of Agios Charalambos and the sea front statues of the poet Andreas Laskaratos and Stamos Petritis. 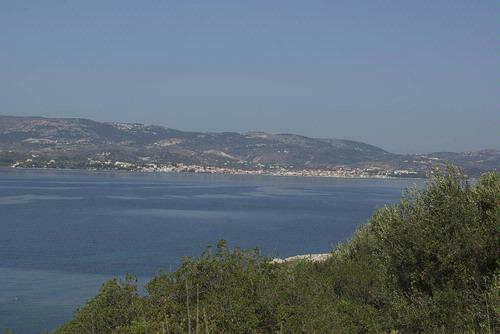 Lixouris is just accross the bay from Argostoli. To the south of Lixouri can be found the beaches of Mega Laccos and Xi. These beaches have reddish sand and shallow clear water. Near Xi beach is the famous Kounopetra Rock which prior to the 1953 earthquake used to swing to the motion of the waves. However today the rock remains but its days of moving are over. On the west side of the Paliki can be found the famous Petani beach.